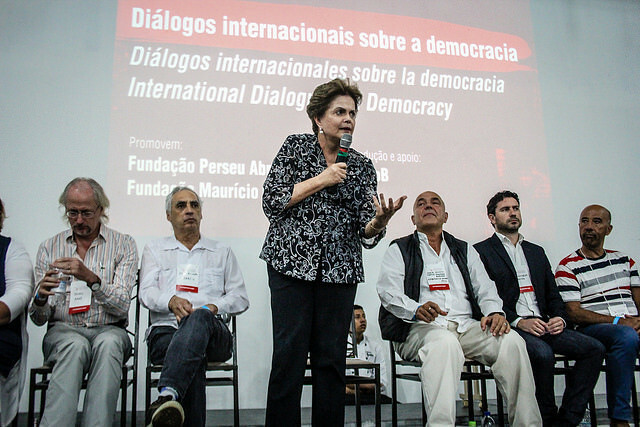 Party leaders and members of popular movements from many Latin American countries and Europe gathered in the afternoon of this Monday in Porto Alegre for a debate on democracy worldwide. "I would like to say to the Latin American partner parties that we have a fight in common, we have developed this fight collectively. Since the beginning of the resistance that we had here in Latin America, going through more strict neoliberal policies that had its major expression in the FTAA [Free Trade Area of the Americas], that we fought together," stated the former president. On the lawsuit against Lula, which tries to prevent him from running the next general elections, Dilma pointed out that the first instance judge, Sergio Moro's action, which determined the conviction of the former president, had no consistency and should not be maintained: "It is a very complex process. It starter with a press conference and a powerpoint presentation. There has been no precedent and one has never heard that a judge can speak outside the process. Brazil has to face itself and for that there is one precondition: the 2018 election cannot be played. It cannot go through any attempt of cheating," she stated. Today Lula has turned into a reference for democracy, be it in Brazil or worldwide. If Lula is stopped from participating in the elections it will mean that, even the limited representative democracy established in Brazil has been disrupted. Not even this one is accepted by them. The Brazilian elite has never had any attachment to democracy. In an exclusive interview for Radioagencia Brasil de Fato, Sandra Lazo, who is vice-president of the Uruguayan organization of popular movements and political parties, Frente Ampla, commented on the solidarity that Latin America shares with Lula and said she is concerned about the threats to the democracy that the continent has suffered. "Latin America knows, very well, what the long and painful process to recover democracy was. I am speaking of what happened in Latin America 40 years ago, when, not for any casualty, under the Condor Plan, there were different dictatorships. We can say that this is another step, but that is not different from the interests of those in charge of it, call it a soft coup or the judicialization of politics," she said. The activities organized by the Committee in Defense of Democracy and the Rights of Lula to be Candidate will be extended until January, 24th, when the former presidents' trial take place at the Federal Regional Court of the 4th Region (TRF4) in Porto Alegre.